If you are an individual looking to apprentice or receive training through a NAITA training program this project will make available career guidance information to help you choose a course. You can select an apprentice/trainee by vocational field, institute or province. Browse the lists below to see skills available (by training course) and then email or call NAITA/topjobs for assistance. Are you looking for technical or vocational training? 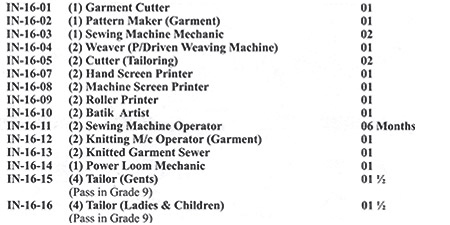 See the lists below for available training courses by vocational field, institute or province. Email or call NAITA/topjobs for help on career guidance and course information.